There’s a saying in Malayalam-Muttathe mullayku manamilla which translates to mean,we don’t value the stuff which is readily available to us.Only when we don’t get it do we realize how important they were.I can so identify with that saying.Each and everything which I didn’t want to have or didn’t like,I yearn to have now. One among many such things is a simple besan laddoo.It was not a grand one compared to its pretty cousin Motichoor laddoo,but still it has its place among the sweets that we or rather my amma,frequently used to make.Besan laddoo was lovingly called Kongini[the way Konkani is pronounced in Malayalam] laddoo by my friends.Come any festival,any occasion,all that they would ask me to bring was kongini laddoo.My aunt even took offense to it saying they should call it by its name and not this odd name:). In a microwave safe bowl,add besan and ghee and mix well. Microwave on high for 3 minutes,stirring after every 1 minute. Mix well and microwave again for 2 minutes in 30 second intervals. Remove and let the mixture cool completely. Add the cardamom powder and sugar and mix well. Add the roasted nuts and divide into 8 equal portions. Grease your palm and shape into laddoos. wow!!!!!! !thats such an innovative way of making besan laddoos! Looks perfect and yummy.. :) Nice pics..
in fact, my classmate spoke a funny Malayalam and her dad always used to say, "Why are you speaking Kongini Malayalam?" Do you like motichur? I can't stand it. I looooooovvvvvveeeee Besan Unde though... never tried to make them :) yours look so pretty. who cares about the shape... 1.5 seconds is all it stays for, right? 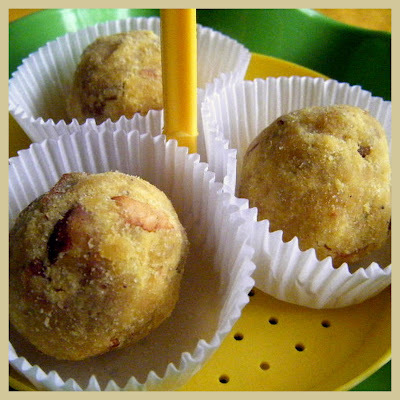 The laddoos look awesome and cute..am not much into sweets..but I love mothichoor once in a while..
Am new to your blog, and really liked the saying that you have written about.That holds true we only value something just because we dont get it.How much have we realized that. Your recipe for the laddoo's is a thumps up. EAsy way of making ladoos..Ur ladoos do look perfect!! I make this on the stove top... but I like this easy method. Making in MW is good for satisfying sweet cravings quickly.Raosting on slow fire, brings out the aroma more. I am really scared to work with Besan..more than working with egg whites! but this version seems to be perfect! So easy! Perfect laddoos too:) Good one, Divya! Wat a coincidence!! I saw just here! Looks and sounds awesome! wow Divya those laddooes looks delicious. Love the idea of making them in microwave. Is very good recipe. Can we use same recipe to make a Vanilla cake?